The average American family washes about 300 loads of laundry each year. ENERGY STAR can help families cut their related energy and water costs. ENERGY STAR certified clothes washers use about 25% less energy and 33% less water than regular washers. Over the lifetime of the product, models that have earned the ENERGY STAR can save $380 in energy costs. They have a greater tub capacity which means you can wash fewer loads to clean the same amount of laundry. 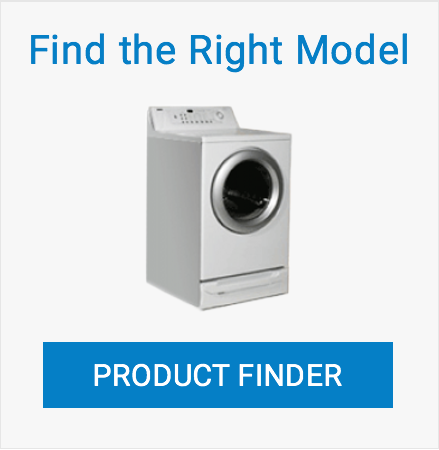 They are available in front-load and top-load models from brands including Blomberg, Asko, GE, Kenmore, LG, Samsung, Whirlpool, and many more. ENERGY STAR top-load models utilize new technologies that do not require the tub to fill with water. They clean using sophisticated wash systems to flip or spin clothes through a stream of water. Many have sensors to monitor incoming water levels and temperature. They also rinse clothes with repeated high-pressure spraying instead of soaking them in a full tub of water. Use less energy. On average, a new ENERGY STAR certified clothes washer uses 316 kWh of electricity and can save you about $35 a year on your utility bills compared to a standard model. Use less water. A full-sized ENERGY STAR certified clothes washer uses 14 gallons of water per load, compared to the 20 gallons used by a standard machine. That's a savings of more than 2,000 gallons of water, per year!! Is your washer over 10 years old? It's estimated that there are 76 million top-loading washers, 25 million of which are at least 10 years old, still in use across the country. Washers built before 2003 are significantly less efficient than newer models. Together, these inefficient washers cost consumers $2.9 billion each year in energy and water. If you have a standard clothes washer that is over 10 years old, it's costing you, on average $190 a year. If every clothes washer purchased in the U.S. was ENERGY STAR certified, we could save more than $3.3 billion each year and prevent more than 19 billion pounds of annual greenhouse gas emissions, equal to the emissions from more than 1.8 million vehicles. Clothes washers originally earned the ENERGY STAR label in May, 1997. Clothes washers that have earned the ENERGY STAR are about 25% more efficient than non-certified models and are more efficient than models that simply meet the federal minimum standard for energy efficiency. Only front and top loading clothes washers meeting the ENERGY STAR definitions for residential clothes washer and commercial clothes washer, with capacities greater than 1.6ft3 are eligible to earn the ENERGY STAR certification. ENERGY STAR certified models are also available in stackable and under-the-counter designs, which fit in smaller spaces. Integrated Modified Energy Factor (IMEF) is a measure of energy efficiency that considers the energy used by the washer during the cycle and while on standby, the energy used to heat the water, and the energy used to run the dryer. The higher the IMEF, the more energy efficient the clothes washer. Integrated Water Factor (IWF) measures water efficiency in gallons of water consumed per cubic foot of capacity. The lower the IWF, the more water efficient the clothes washer. Both IMEF and IWF are provided for each model listed in the ENERGY STAR Product Finder. Save in So Many Ways! Choosing an ENERGY STAR certified washer saves you enough money to pay for the dryer. New ENERGY STAR certified clothes washers use advanced technology to dramatically reduce water use. Full-sized washers that have earned the ENERGY STAR use 14 gallons of water per load, compared to the 20 gallons used by a standard machine. Instead of twisting and pulling clothes around a turning agitator, front-load and advanced top-load clothes washers use sophisticated wash systems to gently flip and spin clothes through a reduced stream of water. This lengthens the life of often-washed items. Because they are so gentle, many models can safely clean silk, wool and other hand-washables. Approximately 65 percent of U.S. electricity is generated by burning coal and natural gas, which releases greenhouse gases into the atmosphere and contributes to climate change. ENERGY STAR certified clothes washers use less energy and help us reduce our impact on the environment. By reducing water consumption, ENERGY STAR certified clothes washers also help preserve our lakes, streams, and oceans. Find out more ways to save water and help protect our nation's water supply. 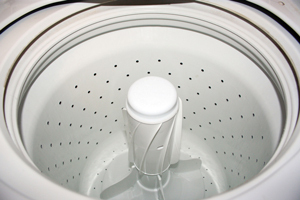 Water heating consumes about 90% of the energy it takes to operate a clothes washer. Unless you're dealing with oily stains, washing in cold water will generally do a good job of cleaning. Switching your temperature setting from hot to warm can cut energy use in half. Using the cold cycle reduces energy use even more. Some manufacturers recommend rinsing the washer each month by running a normal cycle with 1 cup of bleach to help reduce the risk of mold or mildew buildup. Consult the product owner's manual before attempting. Make doing laundry better with ENERGY STAR. Clothes washers and dryers that have earned the ENERGY STAR deliver superior efficiency and performance by incorporating advanced features that make cleaning and drying easier and more effective while saving money on your energy bills. An ENERGY STAR certified clothes washer and dryer can save a household more than $370 over the lifetime of the pair. OVERVIEW: Learn why an ENERGY STAR certified clothes washer is right for you. SPECIFICATION: Find out what makes a clothes washer ENERGY STAR certified. BUYING GUIDANCE: Get helpful information to choose the right clothes washer and make your home more energy efficient. If all clothes washers and dryers sold in the U.S. were ENERGY STAR certified, we would save more than $4 billion each year and prevent more than 19 billion pounds of carbon pollution annually. This is equal to the emissions from 1.7 million vehicles.